Washington Nationals: Should They Be Worried About Their Farm System? Between high-profile trades and several seasons without any high draft picks, the Washington Nationals farm system is not the powerhouse it used to be. Should the team be worried moving forward? At first glance, there appears to be a big question mark surrounding the future of the Washington Nationals. The team has just one consensus top-100 prospect, a sudden lack of pitching depth and has been consistently ranked among the bottom third minor league systems in the league. An already top-heavy farm system took a huge hit when the Nats traded top pitching prospects Lucas Giolito, Reynaldo Lopez and Dane Dunning to the Chicago White Sox for Adam Eaton. Many experts and fans alike scoffed at the deal as a desperate win-now move to win a championship before Bryce Harper departs via free agency in two years. In actuality, the Nationals are much better prepared for the post-Harper era than most people realize. In 2019 — the first season Harper, presumably, won’t be playing in D.C. — the Nats’ outfield should consist of Eaton and Victor Robles, the team’s No. 1 prospect. Eaton has been a very good player over the course of his career despite not earning an All-Star nod and is under team control through 2021. Robles is a top-10 prospect in the minors and has shown real five-tool potential at just 19 years old. While some may cite Michael Taylor and Brian Goodwin as pretty thin outfield depth for the future, the Nats won’t need to look internally to shore up that last outfield spot. Jayson Werth and his $126 million contract come off the books after this season. Ryan Zimmerman’s contract only guarantees him a spot on the roster through 2019. Harper, who will be making $13.625 million this season, and Daniel Murphy, who’s owed $29.5 million over the next two years, will no longer be on payroll as well. Relief from these contracts will provide Washington with some financial flexibility to make a splash in the stacked 2018-19 free agent class. The team will also most likely have reached some kind of settlement at that point in the MASN dispute and will no longer be financing the construction of a Spring Training complex. In the infield, Anthony Rendon hits free agency in 2020. Among everyone on the team right now — aside from Harper — Rendon is probably the biggest candidate for an extension. 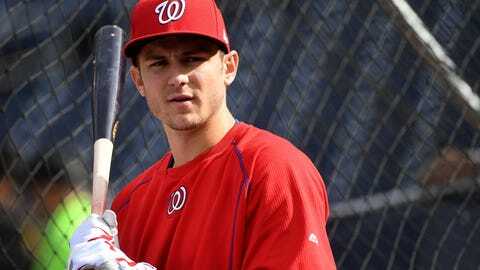 Rising superstar Trea Turner is under team control through 2022. Wilmer Difo will be an option for an everyday job at second base and infield prospects Carter Kieboom and Sheldon Neuse will be close to reaching the majors. The rotation — an area that many seemed to be concerned with as a result of the Eaton trade — is in pretty good shape. Max Scherzer is under contract through 2021 and Stephen Strasburg’s first opt-out is after 2019 (but would be forced to forgo $100 million). Joe Ross has another five years with the team, Erick Fedde’s been quickly rising up the prospect ranks since receiving Tommy John surgery in 2014 and fringe players Austin Voth and A.J. Cole remain the team’s best options at AAA. All in all, the Nationals’ farm system isn’t anything special but the team is prepared. The window of winning a championship with Harper might be closing, but that doesn’t mean the the Nats won’t do it without him.